Sarah and I have been making lunches together for quite some time. And yet…we hardly ever make sandwiches. A classic lunch food, completely ignored! I completely love sandwiches (what’s not to love about food layered between slices of bread?) and yet, I struggle to feel at all original or creative when it comes to making sandwiches at home. But as I picked four bright red tomatoes off the vine growing in my front yard, inspiration struck: caprese salad inside a sandwich! 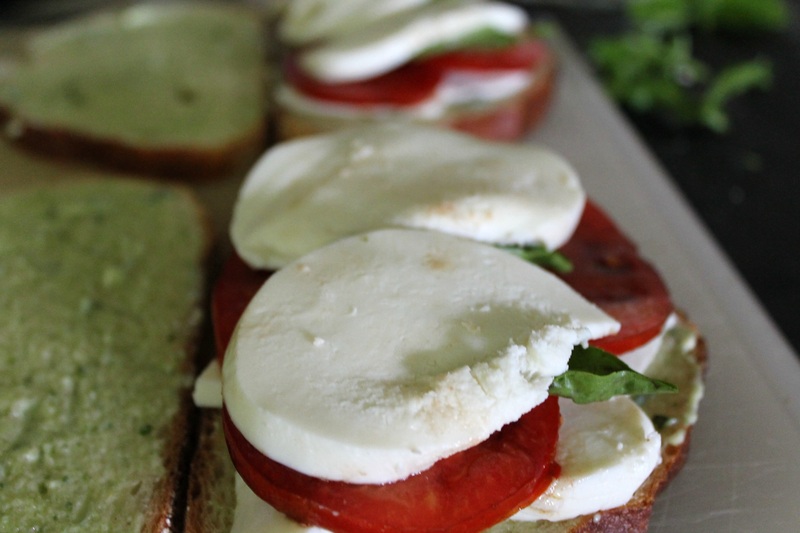 Because what could be better than tomatoes, mozzarella, and basil all together? This sandwich was super messy. Not going to lie about that. But it was also amazingly delicious and very simple! Start by thinly slicing two ripe, red tomatoes. If the tomatoes are very pulpy, then squeeze all the seeds out. Too much moisture will make the sandwich extremely soggy. 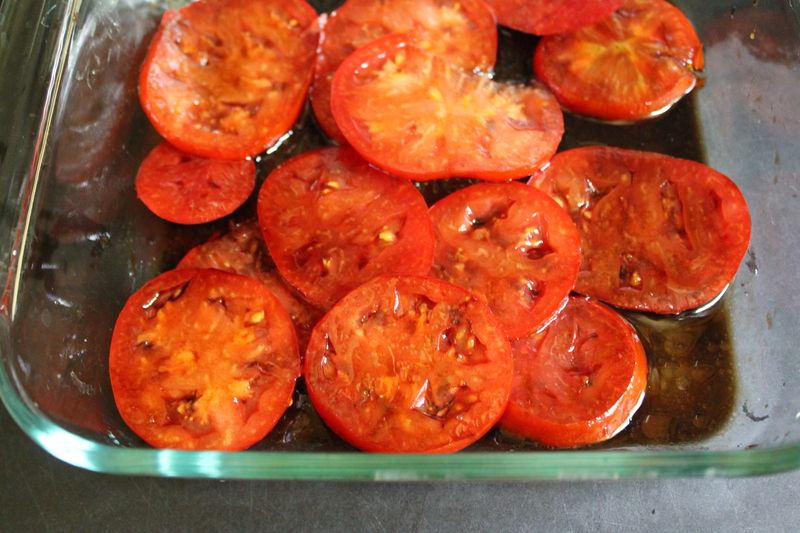 Set the tomatoes in a shallow dish and drizzle with balsamic vinegar and olive oil. Let them sit for 5 minutes. 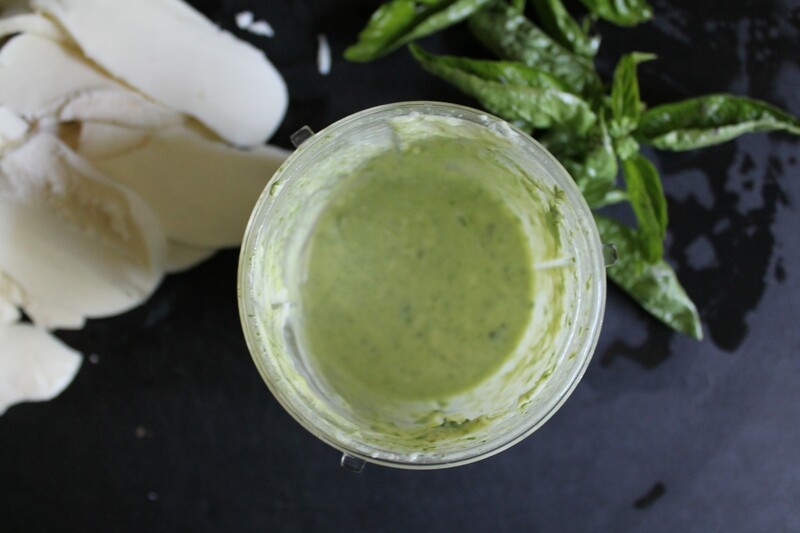 Meanwhile, combine a huge handful of roughly chopped fresh basil with ½ cup mayonnaise in a small food processor. Pulse until the basil is well incorporated through the mayonnaise. Hooray for basil mayo! Don’t stress if it’s a little soupy, because that means the bread will soak up some extra basil flavor, and what could be wrong with that? Also, slice some mozzarella as thinly as possible, and, if needed, slice some hearty artisan bread. (We used white bread, so the caprese flavor would be really prominent.) You could toast the bread, if you like, which may help prevent sogginess. We didn’t—and I’m not sure whether this is an artifact of my panini press or due to using super fresh, unseeded tomatoes, but the bottoms of our sandwiches were less than crisp. Still totally delicious! Time to assemble! Spread one side of every slice of bread with the basil mayo, then layer the mozzarella, marinated tomatoes, and some more fresh basil leaves onto the bread. We thought the combination of mozzarella and basil mayo provided more than enough salt, but if you particularly love salt then you could also sprinkle a pinch over the tomatoes before closing up the sandwich. 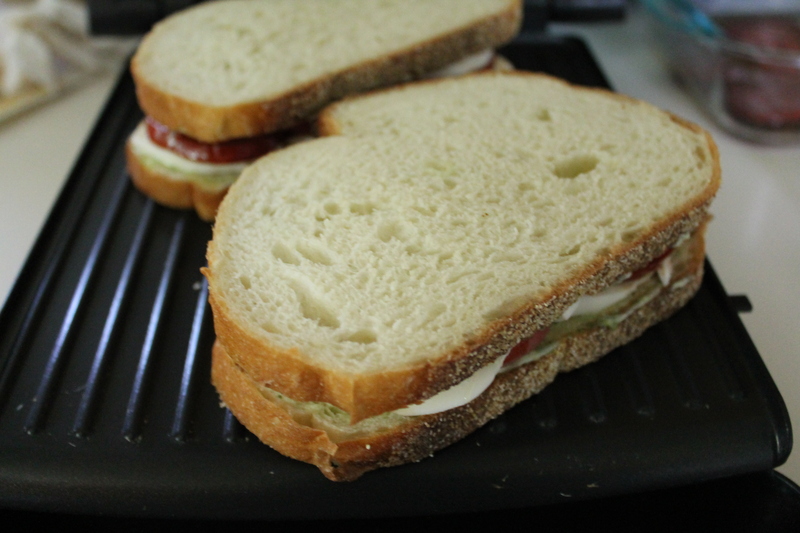 Close up the sandwiches and grill them on the panini press (or in any other closeable griddle, or even cook them grilled-cheese-style in a sauté pan!) until the cheese is melted and gooey, and (ideally) the bread is scored with grill marks. Slice carefully with a serrated knife. Eat immediately. Set the sliced tomatoes in a shallow dish and cover with balsamic vinegar and olive oil. Let marinate for 5 minutes. Meanwhile, combine mayonnaise and about 12 of the basil leaves in a small food processor and pulse until basil permeates the mayonnaise. 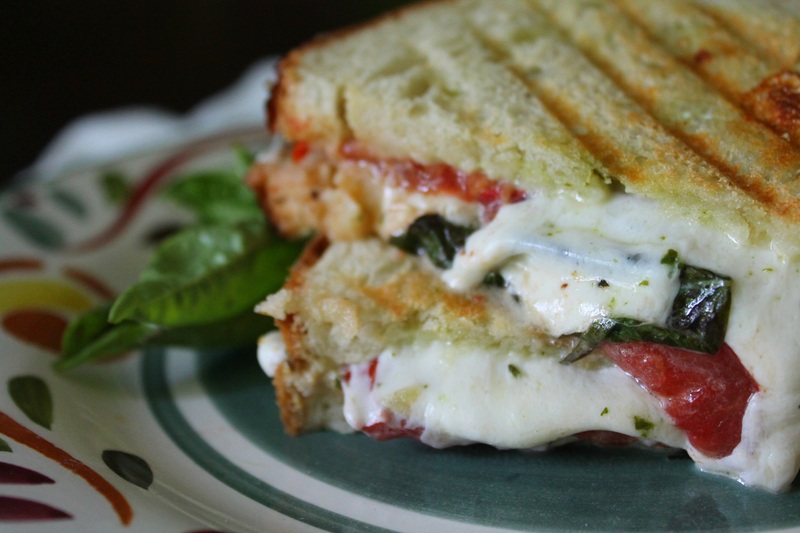 Spread the basil mayo on one side of each slice of bread. 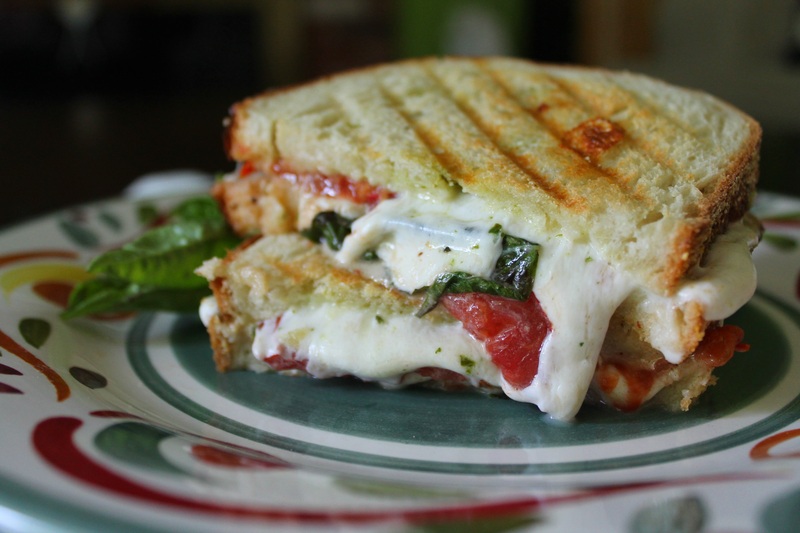 Layer mozarella, tomatoes, remaining basil leaves, and more mozzarella on two of the slices, and top with the remaining bread. Grill or sauté the sandwiches until the bread is golden brown and crisp and the cheese is melted. Thanks for reminding me to post about this! My pleasure. Incidentally, my brother in law is raving about these, and you deserve half the credit!